CIPA's Custom Towing Mirrors were designed to fit over standard factory rearview side mirrors, and are available in over 40 exclusive applications to fit a variety of popular truck and SUV models. The CIPA Custom Towing Mirror is durable, aerodynamic, and sleeve fitted to your vehicles specifications. 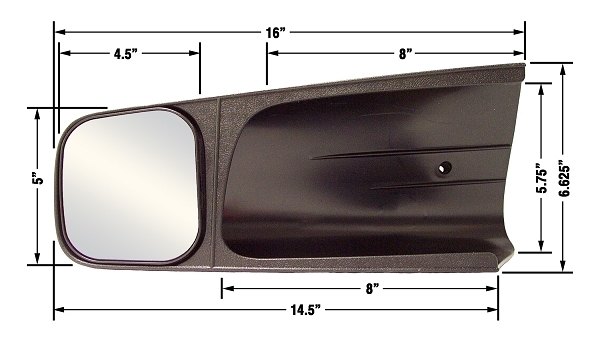 These mirrors will slide snugly over your vehicles existing rearview side mirror, and features an additional adjustable mirror on the outboard end that extends your towing vision, without obstructing your existing vehicle mirror. No tools are required, and no marks or holes are left on your vehicle. The CIPA Towing Mirrors and installation knobs are made with durable ABS plastic known for its strength, rigidity, and unbreakable security. The mirror face is made with scratch-resistant glass for years of unobstructed towing use. The installation hooks are formed from a polypropylene plastic that has excellent long-term shape conformity, and provides years of installation reliability. CIPA Custom Towing Mirrors can withstand the elements to provide increased all-weather Towing Vision capability. This kit includes 1 driver side mirror, 1 installation knob, 1 installation wedge, 2 neoprene strips and illustrated installation instructions. . Note: CIPA Custom Towing Mirrors WILL NOT fit onto stock side view mirrors equipped with additional lighting features that are not integrated, such as LED turn signals, automatic dimming, and puddle lights. Please review fit chart to ensure fit before placing an order.